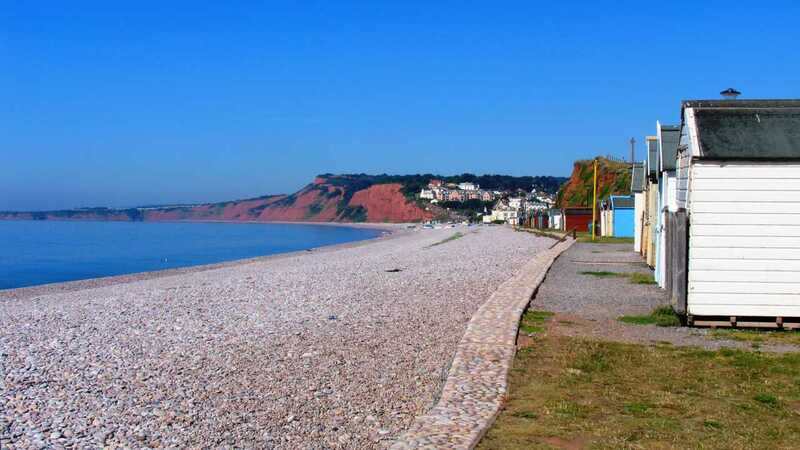 Budleigh Salterton in East Devon is a quiet resort with red cliffs and a flat pebbly beach extending to about 3 miles. The pebbles originated over 400 million years ago when sandstones formed. During the Triassic period these rocks eroded and were then carried by vast rivers to form the 'bun shaped' pebble beds and beach. Devon's famous River Otter enters Lyme Bay at the eastern end of Budleigh Salterton's beach at Ottermouth. The area is quite flat with interesting walks which follow the path of the river inland to Otterton. Budleigh Salterton takes the name from its early history of salt collection and preservation. Salt was collected locally by monks using salt pans that were made at the local Otterton Priory. Hence early references of Budleigh Salterton as 'Salterne'. Budleigh Salterton featured in the book 'Blythe Spirit' by Sir Noel (Pierce) Coward (1899-1973). It was also home to the novelist Anthony Trollope (1815-1882). The sea wall at Budleigh Salterton is the setting of the famous painting 'The Boyhood of Raleigh' by Victorian artist Sir John (Everett) Millais (1829-1896). Sir Walter Raleigh (1552-1618) was born just inland from Budleigh Salterton at Hayes Barton, East Budleigh. Budleigh Salterton was also a setting for 'Nemesis', a BBC TV adaptation in 1986 (broadcast in 1987) of the Miss Marple series by Agatha Christie, starring Joan Hickson. The South West Coast Path enters Budleigh Salterton, East Devon, from the east. To navigate the River Otter, the path goes slightly inland to a crossing, before returning back to the coast. The path leaves Budleigh Salterton to the west and on towards Exmouth, initially descending to the beach at Sandy Bay, then on past Orcombe Rocks. Budleigh Salterton, Devon...The sea water quality is rated as having passed the EC Mandatory Standard and receives a Recommendation (the highest award) from The Marine Conservation Society.